So far Magneto has left Scott Summers and his new Uncanny X-Men. He's been out getting answers for himself after everything that happened in Battle of the Atom last summer (If you still haven't read that, go do yourself a favor. It was the best crossover event of the entire year!) He's been doing things rather harshly as well, asking questions, getting answers, and spilling blood. Recently he's being helped by Briar Raleigh, a girl who he hurt in an outrage some time ago, he doesn't know that though. This issue is another target he was sent for by her. It starts in a dark place, Magneto is sitting in a dark cell. Beaten and bruised, he's picked up by some men in suits who walk him through a hall into a larger room. There's cages surrounded the place, blood and bones everywhere. Erik realizes he's been brought to an arena. The book then takes a Tarantino and takes us back a little bit. Erik and Briar are at a diner having some coffee discussing where Briar is sending Erik this time. Mutants have been vanishing off the streets in Hong Kong with no bodies found, no explanations, no nothing. 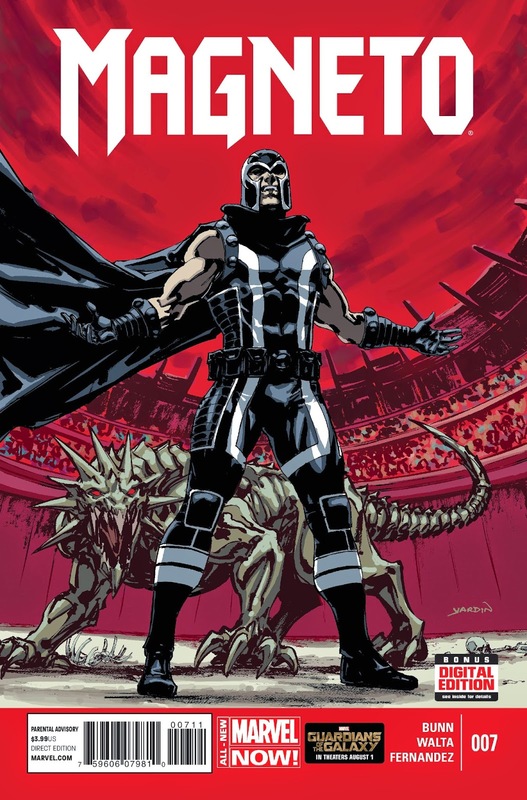 Getting caught isn't going to be the problem for Magneto, since he's a mutant the captures will come to him. Its getting there that may be the hard part. Luckily, Briar has this nice secret jet that she kept a secret from Erik. Also, comic book logic. So now we come back to the present and we finally meet what it is that these people have been forcing the mutants to fight. It isn't each other, it isn't even human. Its the Predator X. A monster made in lab with one job: hunt mutants. Basically, think a Sentinel with teeth and claws. Their only catch, they're covered in metal. And these people don't know who it is exactly that they've thrown into the pit, broken powers or not. To help better stalk and kill their prey, when the Predator X makes physical contact with someone, they automatically build a mental connection. They learn about their target, what makes them tick. What they fear, what they love. This Predator didn't know who he's be making a connection with and Magneto's past leaves this beast shaken, and vulnerable. Erik's able to grab a shank and drive it through the monster's head. The entire arena gets silent. You can hear a pindrop, and the drop of everyone's bank accounts since naturally, I'm sure everyone bet on the monster to win. Screaming for more, Magento is only met with guards. Guards who he kills effortlessly without his powers. With the entire area now empty, he makes his way through the prison to see what other surprises he can find. Those surprises come in the form of two more Predator X's, some imprisoned mutants, and a ringleader who's been injecting himself with MGH. Mutant Growth Hormone. Erik says it better than anyone, "They hate. They imprison and torture. They murder. And still they want to be like us." In a world where humans are afraid of mutants and would capture them to make them fight to the death, this man would want to change his insides to be just like one of them. With a pit of two Predator X's who only hunt mutants and an empty prison, you can only imagine the ending of this book, and that man's life.